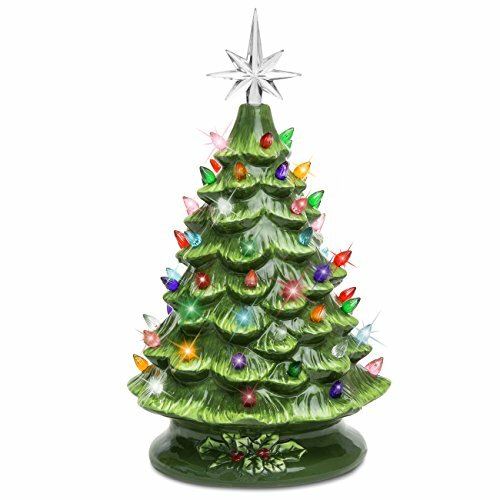 A ceramic Christmas tree is a beautifully crafted decoration that adorns many tables, shelves, and mantles at Christmas time. Typically, they are green, stand up to around 20 inches high, and have light-up bulbs in different colors. Some of them even provide music. Many people buy a ceramic Christmas tree because they reminded them of their childhood when they were most common. While they are not a match to the more vintage options from days gone by, they are relatively close. They are often hand-painted with pristine ceramic and plenty of love gone into their construction. Check out these options below to see if any put a smile on your face. 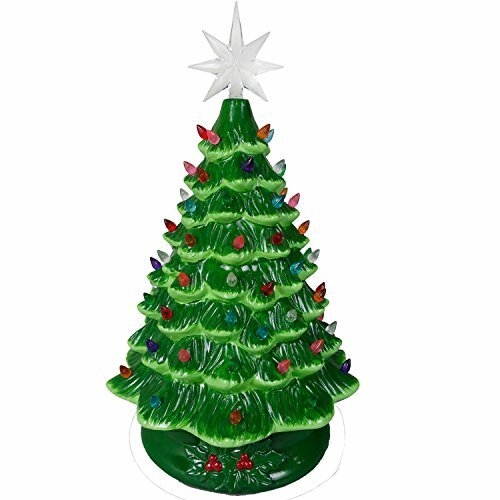 If you want to go back to your childhood and relive the fun decorations from days gone by, then set your sights on this green ceramic Christmas tree from ReLive. As the manufacturer name suggests, you can relive the same Christmas you would have had as a child, with this ceramic ornament sitting pride of place at your dinner table. However, a few things have changed. 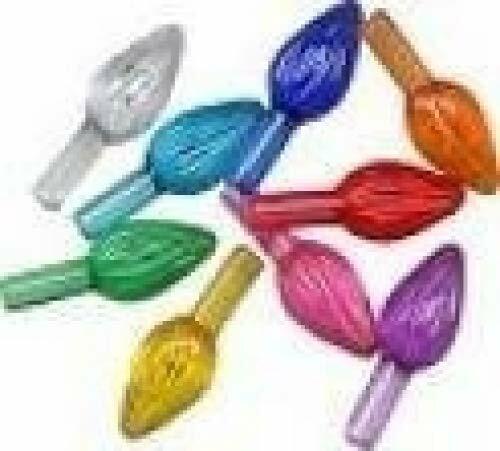 It now offers 50 colored bulbs to add to the festive cheer, as well as being available in a variety of sizes and styles. Choose from 15 different options, then select a height of 14.5 inches, 11, or eight. It doesn’t matter which tree you choose; you will enjoy what you receive in the mail. There is plenty of vintage styling to put a smile on your face, as well as attention to detail which is second-to-none. This ceramic Christmas tree even features a beautiful star to sit at the top – but it doesn’t seem to fit all that well, unfortunately. For a slice of nostalgia, you do pay a bit more than you would expect, but it will be worth it. You can enjoy the ambiance, cheer, and smiles this ceramic Christmas tree brings when you set it up on your dinner table. It might be worth a closer look. If you want to relive Christmas of days gone by, then check out this ceramic Christmas tree from Joiedomi. 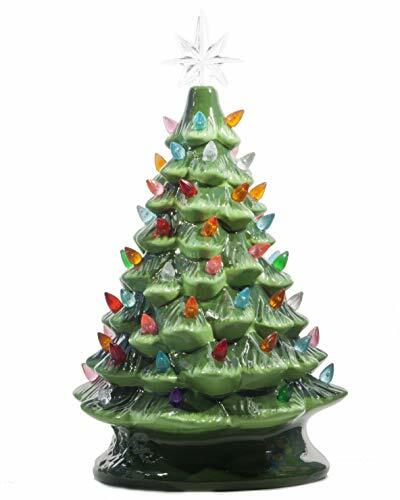 Just as you would remember it from decades ago, it’s a bright, vibrant, and lovely little ceramic tree that adds so much Christmas cheer to your household. But, there are so many things that set it apart as well. It’s nine inches high, making it ideal to sit on any table or bench, and it runs on three AA batteries. These do not come with the ceramic Christmas tree but are easy enough to pick up at the store. It also features durable ceramic construction coupled with a transparent star tree topper securely in place. Then, further down the tree are the multi-colored LED bulbs. These run on the batteries, but do not last as long as people would like. The bulbs are also loose and do not shine as brightly as other ceramic Christmas trees on the market. However, if you are not satisfied with this slice of nostalgia or its delicate detailing, then you can return it within 90 days for your money back. There is no risk in purchasing this affordable ceramic Christmas tree, so it might be worth getting your wallet out. 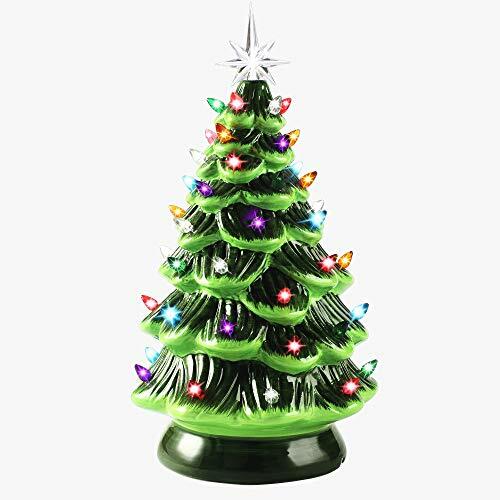 If you are looking for the perfect Christmas decoration to bring a sense of festive cheer into your home, then let it be this ceramic Christmas tree from ReLive. Even though it can cost a fortune to buy, if money is not an object, it’s worth the price tag. What’s more, the manufacturers take great care in getting it to you as safely as possible, so it lasts the distance. Once you get it out of the packaging, you will see that this ceramic Christmas tree is a real beauty. It provides stunning attention to detail, stands beautifully tall at 20 inches, and will work well on any mantlepiece, dinner table, or side table. Anywhere you need to add some festive cheer; this ceramic Christmas tree will come to the party. Aside from its size and robust ceramic construction, however, this ceramic Christmas tree has so much else going for it. It weighs a hefty 11.2 pounds to give it extra strength and also plays music. Few other ceramic trees on the market offer the sweet and dulcet tones of Christmas music. You also don’t need to worry about installing bulbs as you would need to do with others. When it arrives, you can plug it into your wall power source and let it light up the room. It’s not portable since you need to be near a power source, but it’s certainly beautiful. If you don’t mind shelling out for a lovely Christmas decoration, let it be this one. Even though this ceramic Christmas tree is not as big as other decorations on the market, it’s going to hold its own – even next to more substantial items you may have next to it. Such are its fineries and attention to detail that it looks the part and has a striking and unbeatable design. It stands eight inches tall, runs on three AAA batteries which don’t come with it, and even comes with music. It plays all kinds of Christmas classics such as Jingle Bells, O Christmas Tree, and The First Noel. Once you turn this ceramic Christmas tree to begin playing, you will never want to turn it off. If the music is not enough to convince you that this tree is worth a closer look, then the lights will. It features a range of multi-colored LED lights which add ambiance and festivity to any room. You are going to love everything this tree has to offer. It’s even beautifully crafted and painted, has a timer so it will turn off after six hours of non-use, and is compact so you can fit it in more areas than you could a larger one. It might not be the best ceramic Christmas tree on the market, but it’s reasonably close. You can’t put a price on ceramic Christmas trees, especially when they look the part, so ignore the price tag and enjoy what else these trees have to offer. There is no denying they are expensive – especially for something you will only use once a year – but their beauty may persuade you to change your mind. Not only do you get one ceramic Christmas tree, but you get a set of two! One is cream, and one is green, both featuring beautiful Christmas lights that light up any area in which they are. They are also of a generous size of around 13.5 to 14 inches. As a result, you can set them up in a Christmas decoration display, on their own on shelves, or view them from your dinner table. There are also a few other things that may make you ponder whether to buy these ceramic Christmas trees or not. Rather than limit yourself with wall plugs, they run on batteries. You will need three AA batteries for each, but they light up the little bulbs beautifully and last a long time. You may even be able to rerun the same batteries the following year! If you can look past the price tag, you will see these beautiful ceramic Christmas trees have a lot to offer you this year. If you are tired of the same old tinsel, baubles, and traditional Christmas decorations, then it might be time to look at something a little out of the box – such as this ceramic Christmas tree from Midwest-CBK. Even though it’s similar to other ceramic trees on the market, there are a few areas in which it excels. Its Christmas tree coloring is exceptional, with vibrant hues of green and beautiful detailing with shadowing to put a smile on your face. It’s clear to see this ceramic Christmas tree is also handmade, with the careful inclusion of lines to make it look more tree-like than others for sale. It’s also eight inches high – perfect for sitting on top of tables and shelves while being five inches wide not to take up a lot of room. Unlike other ceramic Christmas trees with lighting, this one’s are purely ornamental – this can be a bad or good thing. It can save you the hassle of batteries and wall power, or it can make you not want to buy it because there won’t be the same sense of ambiance. However, if you’re on a budget, it might not matter. It’s affordable and competitive with other similar ceramic Christmas trees on the market. Add some festive cheer to your home with this ceramic Christmas tree from Midwest-CBK. Not every ceramic Christmas tree you buy has to be green. 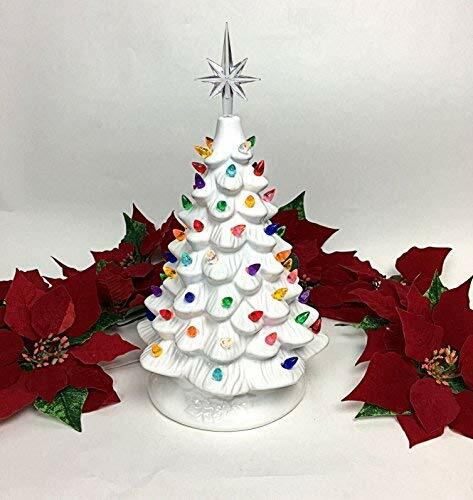 If you like to stray away from traditional red and green Christmas coloring and go for something cleaner and more modern, this ceramic Christmas tree from ReLive could be an excellent place to start. Instead of featuring green coloring with red lights, it’s white from top to bottom. It features entirely white ceramic, a transparent star on top which can be hard to fit, and white lights. These lights offer cool lighting to provide a sense of ambiance. What you will also appreciate is that ReLive takes safety seriously. Their ceramic Christmas trees feature C7 lamps with UL safety certification and on and off switches. It doesn’t get much safer than that! At 14.5 inches high, you also get plenty of bang for your buck. From the top to the bottom of the tree, you get to enjoy 50 bulbs with beautiful lights adorning it. 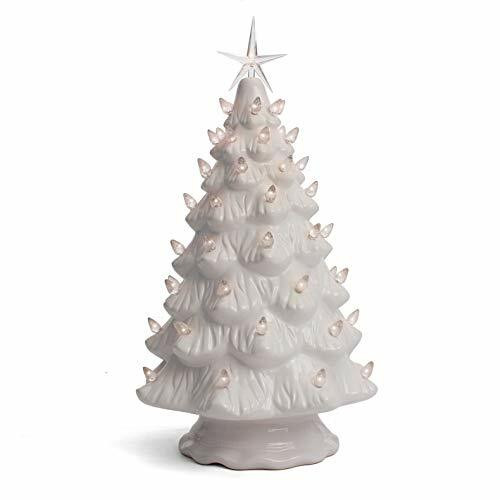 It may not be the most affordable or well-made ceramic Christmas tree on the market, but it’s a beautiful addition to any house lot of decorations you already have. When you’re on a budget at Christmas time, it can seem like you can’t splash out on beautiful Christmas decorations such as ceramic Christmas tree. But, this tree from Miles Kimball is proof that you can get both a stunning tree and competitive pricing. Rather than spend up to $100 on a high-quality ceramic Christmas tree, you can spend but a fraction on this beautiful one. You can choose from a more traditional green tree, or something more modern in white instead. Then, once you make the selection, you will be pleased with it. The trees have 52 multi-colored lights, all set within the hand-painted trees. These lights have 15-watt bulbs which make sure they are more energy-efficient and eco-friendly than other ceramic Christmas trees on the market. For your peace of mind, Miles Kimball also offers UL certification with these trees. Even though the bulbs are not that bright, are loose, and don’t fit correctly, there’s no reason why you will not enjoy setting this up on your dinner table. It has a beautifully glossy and hand-painted finish while also standing out in a league of its own. You will love getting this out of its box at the beginning of December. While you are not going to love everything this ceramic Christmas tree has to offer, it may still end up being your final decision. That’s because for as much as you don’t like about it, there are equally as many things, if not more that you do. The features of this ceramic Christmas tree will astound you. Firstly, say goodbye to traditional Christmas tree colors. When you buy this tree, you get to choose from some unique colors that may appeal more. You can still, of course, get green if you prefer, but there are now pink and rose gold options to put a smile on your face. For the contemporary designer in you, this feature alone may have you purchasing this tree. What’s more, there are five style options, beautiful hand-painted ceramic, and a lovely glossy finish. If that isn’t enough to have you getting out your wallet, then nothing will. It also runs on wall power instead of batteries to save you having to head to the store, and comes with a five-inch power cord, on and off switch, and UL certification for peace of mind. The bulbs are all C7 and easy to replace. It’s affordable to buy, has incredible detailing, and will be a standout in any display. However, there are not enough colored bulbs, it doesn’t look nearly as good as the vintage ceramic Christmas trees, and the star sometimes doesn’t fit properly on the top. The pictures on online listings also look a bit different from the real deal. However, nit-picking aside, this ceramic Christmas tree is well worth a closer look – if only for its stunning color palette. 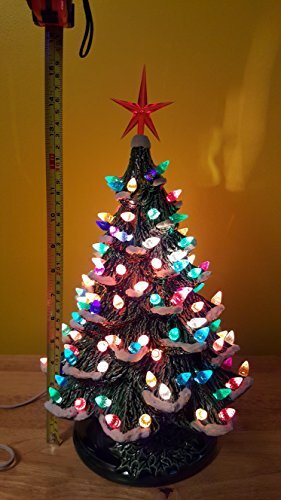 Many of the negative reviews of ceramic Christmas trees relate to their size. Many people say they are smaller than they expected, but often, this has a lot to do with how well you read the description as opposed to something the manufacturer has done. Pay attention to the measurements and double check them. You can then know what you are going to receive in the post. Most ceramic Christmas trees come with bulbs, but did you know that not all of them work? Some are for ornamental purposes only. Find out what the tree you like has. Does it have regular C7 bulbs? LED bulbs? Or bulbs for show? Finally, the condition can be the decider. A ceramic Christmas tree should have beautifully manufactured ceramic with delicate hand-painting reminiscent of Christmas in the past. 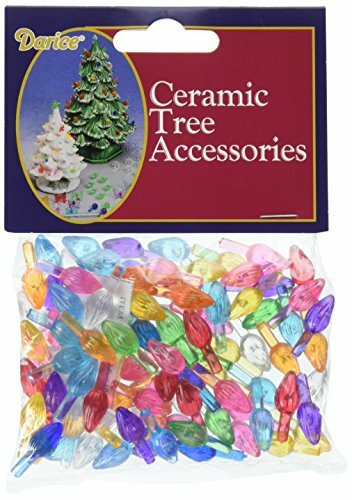 Most people only buy these ceramic Christmas trees because they are what they had as children. Pay attention to the photos and if you’re unsure, read the quality-related reviews.